If 2007’s The Darjeeling Limited was Wes Anderson’s sojourn to cinematic India, tracing the footsteps left behind by European filmmakers Powell & Pressburger (Black Narcissus), Jean Renoir (The River) and Fritz Lang (The Indian Epic: Der Tiger von Eschnapur, Das indische Grabmal), then his latest foreign passage finds the director as émigré rather than tourist, his snow globe city ensconced parallel to the sophisticated, hermetically imagined worlds of Ernst Lubitsch and Max Ophüls. Indeed, Tilda Swinton’s departed dowager is even named Madame D, and it is her cadaver (murdered but well moisturized) which sets Anderson’s madcap caper in motion, hurtling its two heroes – the loquacious and sexually ambiguous hotel concierge Gustave H (Ralph Fiennes), and his meek, beeish lobby boy Zero (Tony Revolori) – across pre-war Zubrowa, as they are hunted by police and the psychotic assassin Jopling (Willem Dafoe). The MacGuffin is ‘Boy With Apple’, a Renaissance-era painting, bequeathed to Gustave H by Madame D, whose cherubic and bountifully endowed subject would be the Dorian Gray of Gustave’s mantle. Perhaps Madame D too saw her lover reflected in its velvety strokes; a courteous man, articulate but incongruously vulgar and unquenchably libidinous (“I go to bed with all my friends“), like a beautiful but slowly rotting apple. Aging is the central theme of The Grand Budapest Hotel, whose story begins in war-torn Zubrowa and is recounted from the pages of a thin hardback, itself based on the testimony of Zero (F. Murray Abraham), who in his autumn years nurses a heart deflated by the loss of Gustave H (“his world had vanished long before he entered it“), and his beloved Agatha (Saoirse Ronan). It is the film’s most accomplished irony, to evoke a timeless place in the knowledge that its time is up, and Anderson presents his comedy in an identical context, in the tradition of a timeless cinema which has long since come to pass. Playing out like a pre-code star gallery, a tale of romance and intrigue set against the backdrop of pre-war Europe (or an abstract of such, as is the mercurial Zubrowa), The Grand Budapest Hotel is unmistakably a movie movie – as in those classics of 1930s cinema, the sets look like sets, the lighting is soft and artificial, the backdrops painted onto a studio backlot, the stars impossibly aligned, but as we didn’t then we don’t care now, for the illusion is spectacular and wholly immersive. Gustave H embodies both timeless European sophistication and the erudite, suave leading men of Classical Hollywood cinema, and Fiennes has a hoot tinkering with the character’s contradictory nature – fastidious but flyaway, eloquent yet coarse, projecting prudishness but barely containing his carnality (“she was dynamite in the sack“). The character may be Anderson’s finest creation, another surrogate father figure whose threatened masculinity – the least acknowledged but most important of the director’s recurring themes – is cured by a son. 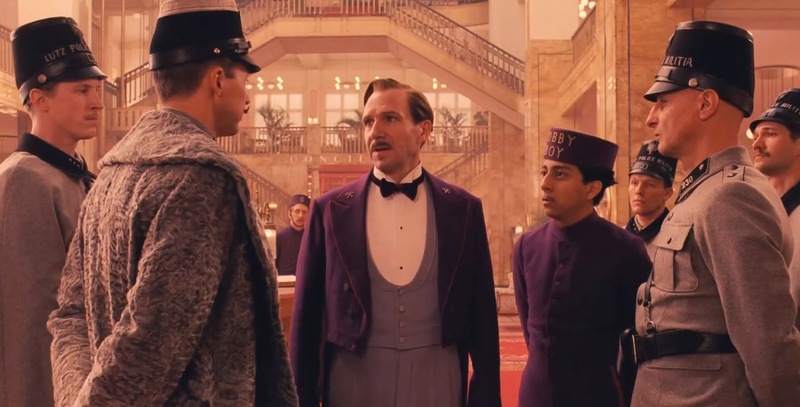 With eight features now tucked under his moleskin belt, the antiquarian auteur is sticking close to his house style, but a new political context (the clamp of communism and rise of a fascist threat; though like Zubrowa itself, the uniforms are a pastiche) informs the diluted palette and darker tone of The Grand Budapest Hotel. If pink remains the defining colour in Anderson’s cinema, the mustard yellow, clay brown and olive green tones of his earlier works are traded here for shades of black, grey and navy, plus the expressionistic shadow and Lotte Reiniger silhouettes of The Fantastic Mr. Fox and Moonrise Kingdom. So too has Anderson’s droll humour stooped to the gallows, with a pungent streak of dark comedy resulting in some severely macabre laughs (the most deliciously revolting of which involves Jeff Goldblum’s money makers), and the melancholia which usually lines his work is here brought centre stage, the tonal balance thrown off by period relocation and a sense of encroaching doom. Needless to say, you’ll find no trace of The Kinks on this soundtrack. 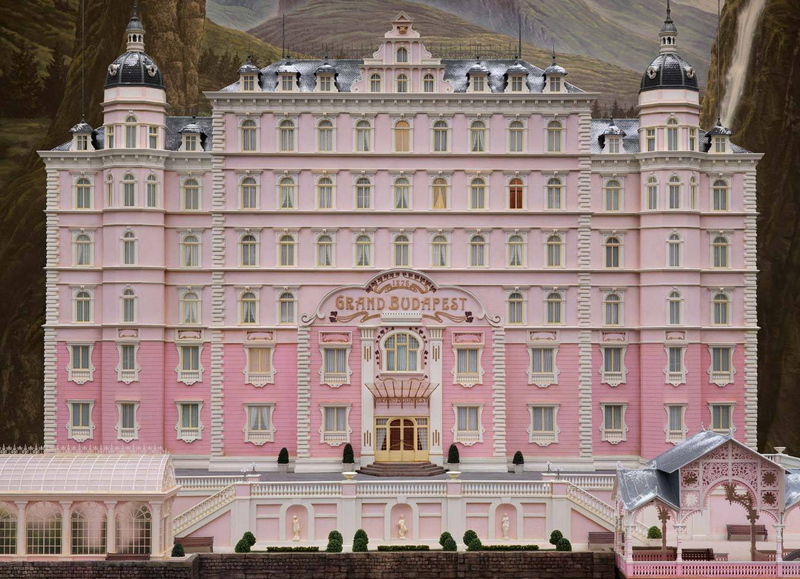 The Grand Budapest Hotel has been marketed as a hammy, daffy ol’ adventure yarn, and in many ways it is – there’s a prison breakout, shootouts, infiltration and disguises, and an exhilarating chase – but the heart of this film lies in its moments of quiet, and as the most literary film Anderson has made since The Royal Tenenbaums, a full appreciation lies in the afterthought. This is not, as the trailer suggests, a quirky sugar rush, but rather a bold, contemplative film about mortality which happens to move at a hundred miles per hour.